Put the cashews in the food processor and process until it creates a flour consistency, but not too long, or it will turn into cashew butter. Remove seeds from soaked dates and puree in food processor until it forms a ball. Add the carrot pulp to a bowl with ground cashews, along with pureed dates. Add coconut, cacao, chia seeds, hemp seeds, maca and coconut oil. Add (amount) of carrot juice, maple syrup, cinnamon and vanilla and salt. Mix well with your hands, combining all the ingredients. Add a few drops of cassia and orange oil. 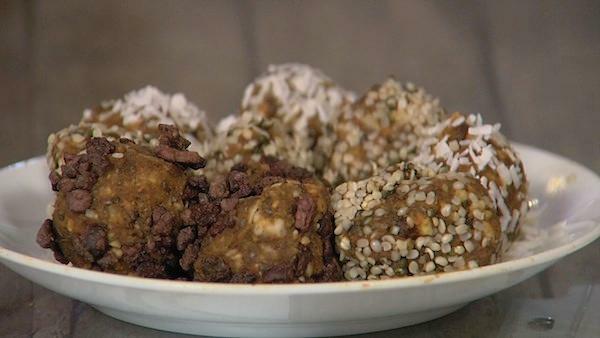 Roll into small balls with your hands and roll the balls in hemp seeds or cacoa nibs.